Welcome to Rotterdam – the city where people make it happen! Rotterdam is up and coming! With Europe’s largest port, Rotterdam is the “gateway to Europe”. Home to two top-notch research universities, it is a city of pioneers and innovators. And its 170 resident nationalities, 2 international airports, and over 1 million annual visitors make for a multicultural melting pot. With so much tailwind, it’s only normal that Rotterdam is also developing into a major European tech & startup hub. Particularly for newcomers, it can be confusing to come across so many organisations, initiatives & information sources. Our interactive map and newsletter are the best way to get started. The map provides a top-down overview of the entire ecosystem, while the newsletter keeps you posted about news & events. The Rotterdam Startup Finder is an interactive map of all companies, investors, people & spaces pertaining to Rotterdam’s startup scene. 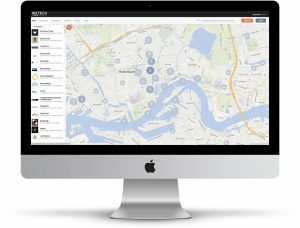 Be it to gain a broad overview of the entire ecosystem or to search for a specific person or company, you can find what you’re looking for by viewing the WeTech Rotterdam map here. Note: If you or your company belong on this map, simply add yourself or let us know! Subscribe to WeTechRotterdam’s newsletter in order to stay up to date with recent news and upcoming events. Erasmus Center for Entrepreneurship: With a community of over 160 startups and scaleups, ECE is one of Rotterdam’s largest startup hubs. Both a co-working space and an incubator, ECE plays a hands-on role in developing some of the highest-potential ideas into successful businesses. Located in the Rotterdam Science Tower, research and innovation are the fundament of everything ECE does. Cambridge Innovation Center: CIC is a brand-new co-working space located in the Groothandelsgebouw in the dead centre of Rotterdam. Originally an American concept, CIC hosts more than 1000 companies in the US. CIC Rotterdam already hosts more than 100 and will host as many as 500 startups and scaleups in Rotterdam alone. Kleinhandel: With just under 10,000 square meters of office and workspaces, Kleinhandel is Rotterdam’s largest and one of its fastest growing (co)working spaces. From innovative startups to individual freelancers and creatives, Kleinhandel has a compelling solution for everyone. 42workspace: The first of its kind, 42workspace is a flex- and co-working space exclusively focused on tech. Freelancers, entrepreneurs and early-stage startups who work there find a community of other tech enthusiasts and specialists. Located at the top of Witte de With, Rotterdam’s night-life and tech quarters, 42workspace frequently turns into an event venue by night. Progress Bar, formerly known as Startup Port, was the first startup-focused co-working space in Rotterdam. Progress Bar is an ideal place for people looking to join a community of founders as well as access to an array of resources offered by the Startup Foundation. Impact Hub Rotterdam: Impact hub hosts nearly 100 hubs globally, of which two are located in the Netherlands. Thanks to this global network, people who travel can work from any impact hub globally. Rotterdam Collective is a further example of co-working spaces with a particular focus on community. Finally, Spaces, HNK and Tribes all have multiple locations across the Netherlands. Alone in Rotterdam, HNK has two and Tribes four distinct workspaces. Erasmus MC Incubator: For young, high-potential startups that are related to Erasmus MC, Rotterdam’s state-of-the-art University and teaching hospital, the Erasmus MC Incubator provides office space, coaching and guidance and access to a large network of professionals. PortXL: As Europe’s largest port, Rotterdam is also home to the PortXL World Port Accelerator. For startups and entrepreneurs active in supply chain or logistics, PortXL has the best network and resources relating to port innovation. Yes!Delft: Tied to the University of Technology Delft, Yes!Delft offers an accelerator program for tech-focused startups, wherein entrepreneurs lose no equity to Yes!Delft. Instead, a success fee of €25,000 is owed to the program after a startup generates its first €1,200,000 in revenue. Beside the accelerator track, there is also a discovery track and a validation lab for younger startups. If you’re looking to connect with specific individuals or want to join one of several large communities, the following organisations are a great place to start. Venture Cafe: Located at CIC, Venture Cafe hosts the largest weekly innovation community event each Thursday. Each week under a unique central theme, this is a perfect opportunity to learn, connect and network your way into Rotterdam’s startup ecosystem. ECE Students: A shared initiative by Rotterdam School of Management and Erasmus School of Economics, ECE Students is the student association for all things relating to innovation and entrepreneurship. Startup Foundation: Based in Rotterdam, the Startup Foundation is an incredibly useful resource for current and aspirant founders. It offers a Startup Chat for an online community, Startup Deals for special offers & discounts for startups, Startup Curated for selective news, Startup Port for knowledge-sharing, Startup Academy and more. BlueCity: More than a coworking space or an incubator, BlueCity carries the cities efforts towards sustainability and a circular, ‘blue’ economy. Located in what used to be a glass-building swimming pool, BlueCity sees itself as the playground for entrepreneurs to co-create the circular economy of tomorrow. Rotterdam’s innovation and startup success rely heavily on the talent attracted and educated through its top-notch research universities. Erasmus University Rotterdam: Known primarily for its faculties Rotterdam School of Management and Erasmus School of Economics, EUR is consistently ranked as one of the top 3 Universities in the Netherlands. Globally, it ranks 21st in Business & Management (QS World University Ranking, 2017) and as 26th most innovative University in Europe (Reuters, 2016). Erasmus MC: Erasmus’ teaching hospital, Erasmus Medical Center (MC), ranks 36th globally in clinical, pre-clinical and health institutions according to Times Higher Education. Delft University of Technology: TU Delft, the Netherlands’ best technology-focused research university, globally ranks 19th in Engineering and Technology and 63rd overall. With the associated incubator/accelerator Yes!Delft, the university plays an active role in bringing state-of-the-art research & technology into the marketplace. Rotterdam University of Applied Science: Known in Dutch as Hogeschool Rotterdam, it does not constitute as a research university but rather, as its name suggests, a university of applied sciences. As such, the curricula of their associate, bachelor and master degrees focuses on practical and applicable knowledge and skills. For founders as well as for investors, it’s helpful to get a feel for the investment landscape and opportunities around Rotterdam. Symbid, for instance, is a crowdfunded investment platform on which private individuals can help fund startup businesses in exchange for a (small) proportionate share of equity. From a library of newly submitted pitch-decks, private individuals can decide which opportunities to support and partly fund. De Investeerders Club is a group of informal investors whose monthly meetups provide young founders the opportunity to pitch their idea, concept or company. Angel Academy seeks to educate more investors about angel investing. Angel investment pertains to investments made in early-stage (pre-seed) startups in need of more than just capital. Teaching investors how to add value beyond the supply of capital funds, and emphasizing the role of mentorship, Angel Academy’s courses help increase the quantity and quality of angel investments in the Netherlands. Keadyn is a Rotterdam-based VC fund focused on tech startups. With five diversified entrepreneurs as partners, Keadyn holds an impressive portfolio of fast-growth, high-potential companies. Their co-investment model is a modern take on investment fund models, where investors can opt-in on a deal-to-deal basis. Finally, Equidam is a very handy valuation tool. Working with founders across the globe, this Rotterdam-based company provides online business valuations as well as personal valuation advice. This was only an initial overview! As WeTechRotterdam, we continuously review & renew our content based on changes in the ecosystem, recent news and upcoming events. Now that you have a basic overview, be sure to stick around for what’s next! No time for social media? No problem: Subscribe to our newsletter to view the best & newest about Rotterdam in your inbox. If you belong on this list but haven’t been included, don’t hesitate to contact us to let us know!